Barrattt Urban Renewal Ltd. commissioned this piece which was unveiled in 1983 when Minster Court was opened. The former Myrtle Gardens had been redeveloped by Kingham Knight Associates for Barratt, the original tenements having been designed under Lancelot Keays housing programme in the thirties. The refurbishment replaced access decks with private balconies. 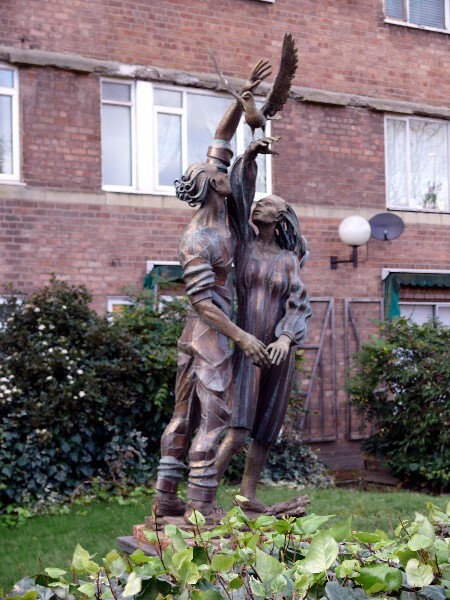 The statue represents hope for renewal and reconciliation after the Toxteth riots of 1981. Sean Rice taught sculpture at Liverpool School Of Art between 1963 & 1980 before leaving to become a full-time sculptor. His most famous work is The Stations Of The Cross In the Metropolitan Cathedral. You might also know his Noah and The Four Winds at Chester Zoo. He also designed the 12 foot high crucifix on the external wall of St Margaret's Church in Anfield and, between 1984 and 1991, the Krypton Factor trophies for Granada Television.